But the sanctity of her small town is shattered when Poppy’s widely beloved grandmother, Rose, is brutally killed the night of a neighborhood barbecue. No one knows what to make of it or who might be responsible, least of all Poppy—until Detective Owen Peirce arrives from out-of-town with strange questions and a family history far more sinister than Poppy ever imagined. I enjoyed reading Roses but I had issues with following some of the content. 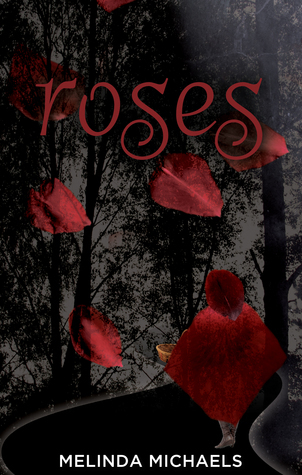 See, Roses is book 2 in the Golden series by the same author and the characters and storylines from the first book are heavily involved in the latter part of the book. Which made it very hard to follow at times because the characters (mainly Owen) would talk about events from the last book. If I had read Golden first and then read Roses, then I would have a better grip on the storyline. Don’t get me wrong, I really enjoyed the book. The original retelling of Little Red Riding Hood with shades of Sleeping Beauty, Cinderella and 1001 Nights thrown in really kept my attention. I also liked the distinctions between the Good, the Others and the Storytellers(basically the fairy tale characters descendants, the villain descendants and the fairy tale writers descendants). I never gave thought to what happens after the fairy tale ends and there are children on both sides. Also, that both the fairy tale descendants and the villain’s descendants are destined to relive the fairy tale is pretty interesting too. I felt bad for Poppy but that girl got on my one last nerve. She came across as a childish, spoiled brat who defied Owen at every turn. I mean, someone is out to kill her and she just takes off for New York City to go see her best friend. Doesn’t answer her phone and then acts like a brat when Owen tracks her down. Made me want to tear my hair out or reach through the book and give her a shake. She did grow on me after New York City and I actually liked her at the end of the book. Owen, I liked and I felt bad for him. He had such a tragic backstory and what happened to him when he was younger did shape him into the person he became as an adult. I also liked, really liked, that he didn’t want to follow his story. He wanted to make his own story and in a way, he did. He did go to California to rescue his princess but came back for Poppy. If I had any doubt about his feelings for her, they were definitely cleared up when they reunited. The end of the book really had me on my toes. The author did a great job keeping the killer’s identity hidden up until the end of the book. I was a little surprised by who the killer was but it fit perfectly with the book. Why: Roses definitely kept my attention while reading. From the complex characters to a great plot, Roses is on my keeper list. Now, why I gave it a 3.5 rating: It is not a stand-alone book. Why: This is a very clean book. Some mild violence and language and one kissing scene.